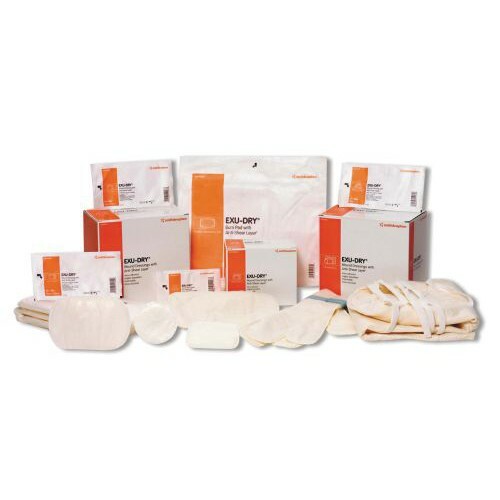 EXU-DRY is a unique one-piece wound dressing designed to help reduce pain and trauma, save nursing time and lower total dressing costs. EXU-DRY replaces non-adherent dressings, gauze and abdominal pads.Non-adherent to the wound, EXU-DRY is more comfortable for patients during and between dressing changes. EXU-DRY's Anti Shear Layer reduces friction and shearing and helps protect the wound. EXU-DRY's one-piece multi-layer sealed construction eliminates frayed edges, loose threads and linting. EXU-DRY will not disturb new granulation tissue thereby supporting the healing process. Highly absorbent, EXU-DRY reduces the risk of maceration and irritation to the wound and surrounding tissue. EXU-DRY wicks away drainage from the wound into the entire dressing, reducing the frequency of dressing changes. Non-occlusive, soft and pliable. Because EXU-DRY is permeable and non-occlusive, it can be used as a wet or dry dressing on clean or contaminated wounds. EXU-DRY is compatible with most topical agents, liquids and creams.